This Award is sponsored by the Office of Proposal Development at Rowan University to Rowan faculty investigators to support preliminary efforts towards establishing new and innovative research and is primarily intended for new investigators in a research area or creative activity. Dr. K. M. Yenkie’s research is aimed at understanding chemotherapeutic cardiotoxicity in patients undergoing cancer treatment using a systems engineering approach. The concerns regarding inferior quality of life and premature mortality in treated patients can be addressed with personalized treatment and long-term patient management strategies. 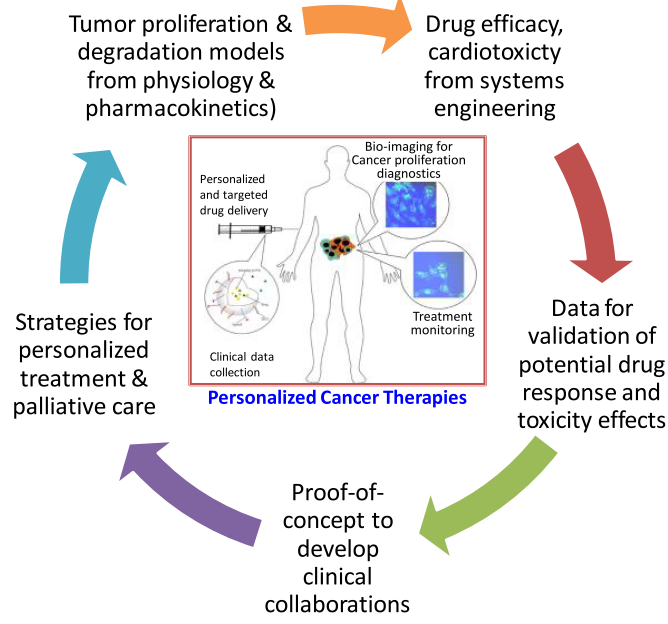 Systems engineering methods such as data analysis, physiological modeling of cancer proliferation, tumor degradation, drug efficacy and cardiotoxic effects, machine learning for biomarker identification, and optimization for personalized treatment and palliative care can act as guidelines for medical practitioners to monitor cardiotoxicity and treat patients effectively.